Lori and I had enjoyed a day on the trail, but thought we could sneak in one more stop before heading home. Checking out the map we decided Mediterranean Cellars would be the most logical stop. So as we twisted and turned I saw vineyard signs and took a left instead of a right and we found ourselves across the road at Marterella Winery. A few minutes into our tasting Lori said, "Your car turned in the right direction for a reason." 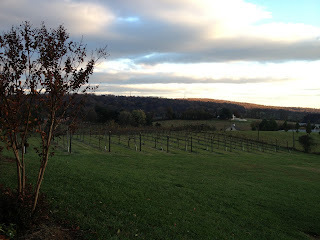 We discovered a hidden gem, not listed on the 2012 Virginia Wine map, you can find it on the VirginiaWine.Org website. With a full, jovial tasting room, Marterella is a local hot spot and hangout. Kate Marterella owns and runs the tasting room and seemed to have plenty of energy to keep simultaneous tastings going single-handed! 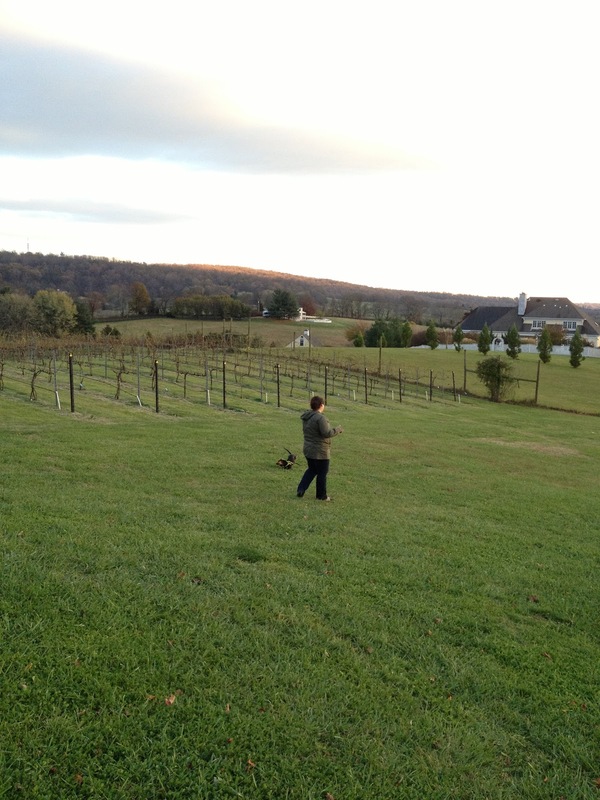 Kate and her husband, who unfortunately passed recently, planted vines in 2000 and started making wine in 2003. 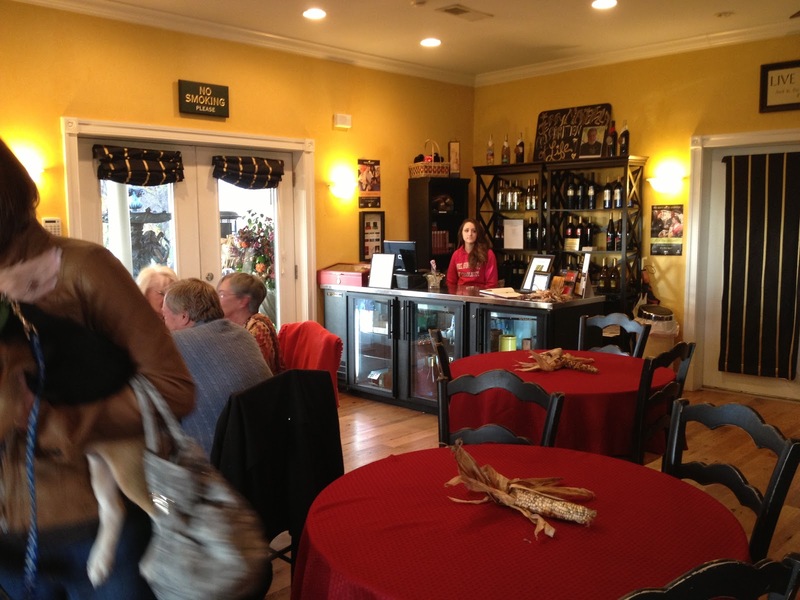 The tasting room adjacent to her home is about 6 years old and features an outdoor fireplace on the patio with plenty of seating as she also serves Italian pizzas to hungry visitors. On our visit we tried 13 wines for $10, visitors have the option to do the full flight or just the reds or whites for $5. We started with the new, not yet bottled 2009 Vidal Blanc which was refreshing with a hint of tropical fruit. We also worked our way through the 2010 Pinot Grigio, NV Viognier, 2008 Chardonnay and 2008 Barrel Select Chardonnay on the white side. While we enjoyed most of these wines our favorite aside from the Vidal Blanc was the steel & oak blended 2008 Chardonnay that had a touch of butterscotch. The 2010 Rosalie's Rose was a sweeter rose made from mostly Merlot followed by the 2009 Heritage Dry Rose which was quite the opposite with 100% Merlot and 24 hours on the skins it had a nose of rose petals. For the reds we worked our way through the 2008 Merlot, 2007 Cabernet Fran, 2008 Meritage and the "Vegas Wedding." My favorites were the 2008 Merlot, it was jammy and not too dry, as well as the 2008 Meritage (Merlot, Cab Franc, Cab Sav & Petit Verdot) it was a big red. Lori also enjoyed the Meritage as well as the Cabernet Franc which in my opinion was a softer, slightly fruitier Cab Franc that what I prefer. Now this "Vegas Wedding" is a Meritage blend of sorts, its the Cabernet Franc mixed with the Merlot (post bottling) to create a surprisingly smooth combination. Finally we tried some dessert wines, the 2010 Grace made from Vidal Blanc & Riesling and the 2010 Sweet Nothings, a sweet Chambourcin with raspberry hints. Lori loved both of these! I should also note that for the chocolate and dessert wine lovers, Marterella has local, custom made chocolates infused with their Sweet Nothings that you can purchase at the tasting room. We had a great time at this stop and even though we made it in during the end of the day, the tasting room was full of life, human and canine. It was a cozy and welcoming stop, its too bad we didn't have time to cross the road to Mediterranean, on my next trek in that direction I'll just have plan time to go to both wineries! We visited Marterella recently, too, and enjoyed it. The dogs were great -- having a great time in the weekend sunshine and welcoming all the visitors on the patio. Really liked the port-style wine, which we got as a Christmas gift for my sister-in-law. Seeking Quality Reds? Found. In Virginia.